The Bitless Bridle. Have you made the switch yet ? There is a lot of talk these days in horsey circles, barns, trails and online about the bitless bridle. They are not a new invention by any means, but are definitely gaining in popularity, with more and more people using them than ever. Many horses ridden without a bit are still yanked, jerked, pulled and pinched in the face by inexperienced or rough hands holding the reins. 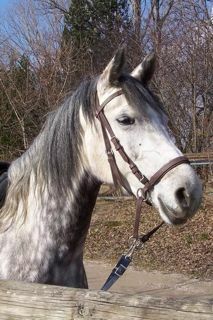 I first learned to ride with a type of bitless bridle ~ a hackamore. The horse that I was given for my birthday came with this bridle, so that's what I used. His tongue had been severely injured at some point during his previous career, and he couldn't be ridden with a bit. Whatever type of bridle ~ or lack there of ~ you choose when riding, it is essential that you have clear and direct cues, aids and boundaries that both you and your horse understand and agree upon. Without great communication between the two of you, misunderstandings are bound to happen. When your horse isn't clear about what you are asking, he is more likely to seem stubborn, anxious, dominant or disobedient, as Kathryn Kincannon-Irwin discusses in this article about the bitless bridle that appeared in Horses All magazine. To make the transition to bitless smooth for both you and your horse, it will help to do ground exercises, lunging and ground driving before going for that first ride. Both you and your horse will be more confident, knowing how the bridle feels and works. This may also be a good time to enlist the help of a trainer or experienced friend who can watch from the sidelines. The extra pair of eyes can help spot where the communication between you and your horse may be breaking down, and help you fix any problems, before you or your horse get frustrated. The first time you ride with the bitless bridle, you will want to go through all the basics with your horse in an enclosed riding arena or paddock if possible. For the safety of both of you, it's best not to experiment with new tack out on the trail. It is especially important that your horse STOPS! If there are any problems, being close to home will allow you to work through them in a safe environment. Once your horse is responding lightly, with ease and confidence it is safe to hit the trail in your bitless bridle! Do you use a regular or bitless bridle?